Rotarian Rosemary Shaw was recently hired to join the Capital Campaign dream team at Kitsap Humane Society (KHS). Congratulations! To aid my research and interview for this article, I asked Rosemary for the grand tour through the shelter, and she graciously agreed. As we walked and talked, she told me that following her heart is what got her involved with KHS. During the 27 years she worked in Occupational Therapy at a large public hospital in San Jose, CA, she also volunteered at a local animal shelter and loved it. When she moved to the Island, she quickly became a KHS foster parent (for puppies!). Soon after that, KHS asked her to join the shelter's Board of Directors. Over 6,500 animals (mostly dogs and cats) come through the KHS doors annually. A high percentage need medical care and special attention to become adoptable. Because of the dedicated, skilled staff and volunteers at KHS, and because our local community is animal-loving and compassionate, over 95% of KHS animals are either re-united with their owners or adopted into new, loving homes. As I toured the facility, it became clear to me that this is a critical time for KHS as it enters its $5M+ Capital Campaign for building expansion. The current shelter was built in 1989 and it is worn and outdated, no longer fully meeting the needs of the animals it helps. The lifesaving medical treatment area needs overhauling. The hospital recovery quarters are cramped, and the building needs better ventilation to prevent the spread of disease. On top of this, the old-style kennels are far too small for the dogs. Says Rosemary, "There's no doubt that I am inspired by the work I see every day I am at KHS. And I am motivated by our goals for a new facility. Groundbreaking for Phase I could be as early as next summer as we have already raised over $1.M so far." Rosemary invites fellow Rotarians to schedule the KHS grand tour with her. I do recommend this, the tour is fun and instructive. 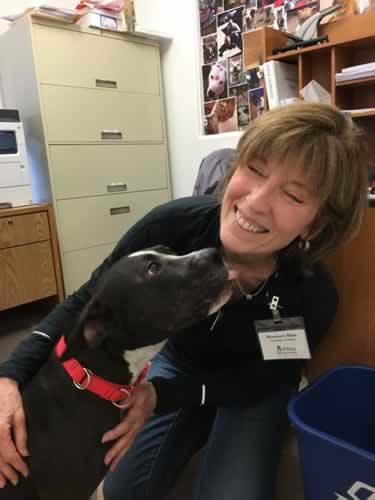 Or, if you'd like to volunteer with KHS or adopt a pet, or become involved on any level, Rosemary invites you to contact her, she'll make it happen.